Hello! Thank you for stopping by. I am so glad you decided to visit me today. Thank you for the lovely comments you leave me, too, they mean a lot to me. This week's sketch is up at Tuesday Morning Sketches and this one is by Debbie. It's a really fun, easy sketch. My card features stamps and papers from the April 2018 Simon Says Stamp monthly kit. The stamp set is called Beautiful Day. I tried to create a focal image that would make on think of sun catchers. I need to perfect this technique, so please be kind. I used some embossable acetate from Judikins. I stamped the image using VersaFine Onyx Black ink and then added some clear embossing powder. Even though I had my gun preheated the acetate still warped quite a bit. Then I turned it over and filled in the different spaces on the butterfly with Nuvo Crystal Drops in Duck Egg Blue, Green Apple, Bubblegum Blush, Mountain Dew (clear - I thought it would have some shimmer but in the end, it's just clear), Silver Lining and Ebony Black. 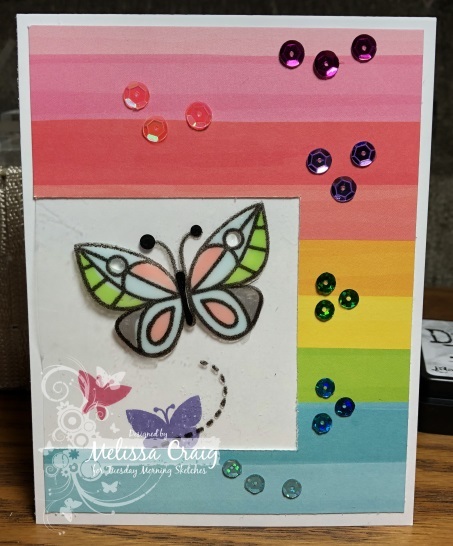 Then underneath the acetate, on the card base, I stamped two butterflies in the ink colors that came in March's kit. The focal image did come out bigger than I originally intended but I wasn't about to start over. I cut open an aperture in the decorative paper and put the acetate piece in it's place. Then adhered to the base. Then it still needed something, so while I was video chatting with my oldest son, I started playing with sequins. I couldn't do exactly rainbow because I don't have a lot of different colors of sequins but this seemed okay. Well, truth is I actually hated it at first and was going to scrap the whole thing, but the more I looked at it the more I kinda liked it. Thank you, again, for stopping by. Please be sure to visit the design team - they did an amazing job. They always do! I'll see you over at the TMS blog. What a FUN, FUN, FUN card. The rainbow background with the sequins up the one side is really a nice touch. Perfect backdrop for those fun butterflies. This is a happy card. Nicely done! I love the rainbow colored background with the sequins and sparkle! The Nuvo drops look beautiful on that butterfly and this turned out quite pretty! Well done with the acetate - something I still have not quite mastered! You're too hard on yourself! Beautiful card! I love the butterflies against the rainbow BG!! What a bright and cheerful card! Fun use of the sequins. A Lovely bright and happy card, love the butterfly. There you go again missy Melissa - your card turned out wonderful, very inspiring as I have never tried stamping on acetate. You go girl - you're always up for anything and YES you do pull it off great every time! !